It is Autumn in Melbourne, some of the trees are changing colour and their leaves are falling in all shades of gold. It will be a warm day but right now the air is crisp and still. The Kindergarten is in a quiet street, but 100 metres or so to the east it is loud and busy with morning traffic.At 8 am all is quiet as the two staff members survey the Kindergarten and begin setting up the outdoor activities. There is a mixture of indoor and outdoor play and all the areas of child development are catered for through a range of activities which in themselves cater for more than one area of development.The collage table is a permanent fixture and it is here that the children extend physical and cognitive development through making things. 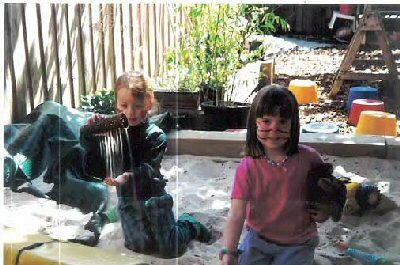 The sandpit outside provides the satisfaction of being with: friends ( social development), the tactile sensation of playing with the sand (emotional development) and the manipulation of the sand and the containers and tools ( cognitive development). The book corner and the puzzles are permanent fixtures also and provide opportunities for the beginnings of literacy and numerical development. There are other ‘subtexts’ but this is enough for a demonstration of how one activity can provide opportunities for development in more than one area. The programme has been planned for 2 weeks for 5 children and in its execution will also cater for all other children, with careful observation and interpretation by the teacher and carers. To bring about the programme, anecdotal observations are taken of each of 5 children, a number chosen for optimum attention to details. All carers are asked to record anecdotal ‘happenings’, such as how a child interacts with other children, how they went about doing a painting. Parents have been asked for their input for more insight, detail and information, such as any recent family celebrations, changes at home, etc. The teacher looks closely at these anecdotes and interprets them, for instance categorising them into the areas of development, and identifies an area for focus. Thus the programme begins to take shape with up to 3 areas of development on which to focus for the next 2 weeks. This programme has goals of developing confidence and self esteem (social and emotional), becoming competent in management of the body to develop physical skills, and extending interests (cognitive). The goal for each child is broad enough to encompass the needs of all children, and it is often possible for 2 children to share the same goal with different emphases dependent on age or ability. This is made specific for each focus child through objectives. For instance if the goal is to develop physical skills, one of the objectives might be either ‘to determine hand preference’ or ‘develop pincer grip’. Some children arrive shortly after 8 am and begin to engage in the activities. Someone may need extra assistance to separate from his or her parent, but soon they are settled into an independent activity or with the caregiver or with a friend at a small group activity. Many of the children like to help early in the day. These first activities often indicate the child’s interests and later they may be guided to play in a small group where a skill may be developed or extended, e.g. the wooden blocks are a good place to develop eye-hand coordination, the construction area will be where the children may develop that pincer grip of using finger and thumb. We have our morning circle with Didi accompanying on her guitar and we sing our Sunrise songs and many of the children’s favourite songs. Then we meditate before fruit time. 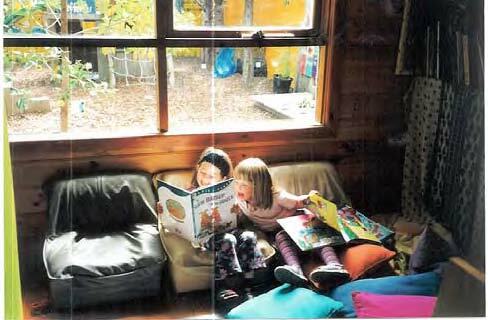 Later, before lunch, the children join the yoga group or take part in the ‘pre-school’ group time for storytelling, drama and music. The latter is also a very important part of the emergent curriculum. The children’s interests and abilities to concentrate and take part guide the content of each session. It is also lots of fun for the children and the teacher as a story or topic can lead into any adventure. For instance a trip to the jungle may require camping equipment, travelling on a plane -and then the animals we see -WOW!! We enjoy our days at Sunrise. We share many of the tasks that go with looking after small children. As well as our Director, Didi Ananda Tapomaya, we have a Kindergarten teacher and two qualified Child Care workers. It is a Long Day Care centre, open from 8 am to 6 pm and the staff works a range of hours across the week. The children are 3 years to 5 years old, and we have 22 children. Some of them will go to school next year while for some it is their first experience away from home. We often think we are like one big happy family and we love to see all the children develop and grow.